Youenn May 30, 2017 June 1, 2017 6 Comments on Daj Się Poznać 2017, The End! That’s it guys! This is the end of Daj Się Poznać 2017, the Polish blogging contest I’m taking part in since the beginning of March. In today’s post, I’ll be doing a retrospective of the whole contest. Wait… What happened during the last 3 months? got more familiar with F#, WebSharper and the Web Dev world in general. attended the 2-day wedding of my friend and colleague Krzysiek. attended several ReactJS workshops and Unity 3D Game Dev meetings. participated in an intense, 3-week-long chatbot contest between all our offices here at Infusion and ultimately grabbed the 2nd place with the Wrocław team! Oh and I almost forgot… I also went to work! So… Was it a worth it? Blog, try out new ideas, and strive to keep you interested! Prove to myself and others that F# is an awesome language! 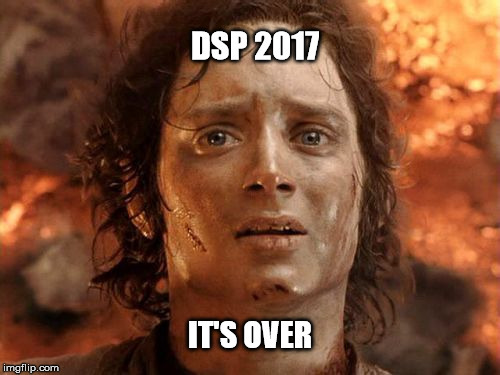 I want this DSP adventure to be all about the journey, not the destination, and as such I made the intentional choice not to commit to a specific task to implement just yet. Let’s see where the wind takes us. I believe I manage to achieve all those goals and I’m pretty happy to say that, Yes!, it was worth it. I learnt a lot during those 3 months, had fun with different technologies, and most importantly, I had the opportunity to make my own, small contribution to the online Tech community. I wanted to leave something of quality that could help or motivate others, even if it required me to spend 8 to 10 hours preparing and writing each post. I hope that I succeeded in doing so and that readers found at least some of my posts helpful and interesting. You said readers!? Did you have any? Yes, surprisingly! From early March to the time of writing (30th, May 2017), 6 425 visitors came to the blog for a total of 9 093 views: I have no idea if it’s a lot or not, but seeing the first visitors coming to the blog along with receiving words of thanks from complete strangers was a very nice experience. What to remember from the contest? Here are a few of the posts which I believe distinguished themselves the most during the contest. Definitely my favourite! It was well welcomed by both F# and C# developers and it helped me make my very first appearance on the fantastic F# Weekly blog of Sergei Tihon. This was probably my proudest moment of the whole contest! I believe this post contains valuable information on how to avoid (or at least mitigate) some of the common pitfalls we too often encounter in Software projects. This was also my longest post. This post is about one of the little things that annoy me the most in the mainstraim OOP languages: exceptions! It ended up being the most popular of all the posts I wrote. I was quite surprised to see how many people shared a similar point of view! A list of fun resources about programming: get your daily dose of memes, gifs, comics and more! Everyone loves a small benchmark from time to time. In this post I compared the performance of the OO approach of C# with the more functional approach of F#. If you’re interested, here are a few statistics about the blog itself. During the contest, I wrote 22 posts (not including the current one) for a grand total of 24 834 words. 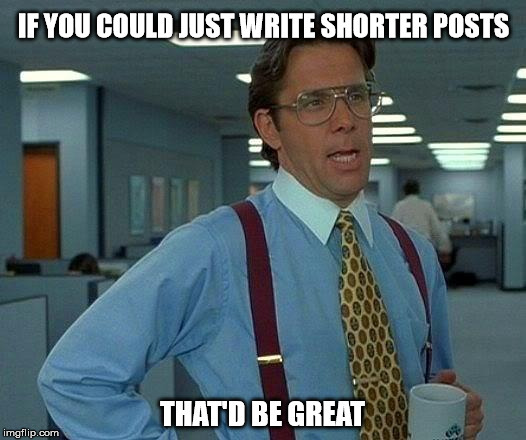 That’s around 1130 words per post in average, with the longest post reaching 2753 words! As you can see, keeping posts short was most definitely my number one problem during the contest. This is why I tried to add gifs and memes to my posts to allow the readers to catch their breath. Yes! I’d like to thank Dawid for motivating me to take part in the contest, Stanislav and Krzysiek for their valuable feedback, Piotrek i Michał for their insights on Putting together the Software Dream-Team. And most importantly, special thanks to Aga for making neat illustrations on demand and for being patient and understanding while I was preparing and writing all those posts! I didn’t know your blog is part of some contest. Your articles are easy to understand and well written. Are you going to continue with blogging activity? I would greatly appreciate it ! Thanks for the feedback Potom, it is much appreciated! I hope you found at least some of those posts helpful. I will continue to blog for sure, but not twice a week as I used to during the last three months :). I’d like to write more about F# so I need to find time to prepare some content. Thanks Dawid, congrats to you too! I’ll keep it running for sure, but not twice a week ;)! I’m not a programmer and despite this, you are able to catch my attention and interest. Great job!